The new pier boasts two substantial berths for the regular ferry service provided by MV Finlaggan and MV Hebridean Isles, and can also accommodate the grain vessel bringing in barley for Islay whisky industry. For the first time the pier can now be accessed by vehicles and this will allow for the unloading of other bulk carrier vessels when required. The works have also upgraded the ferry terminal water, lighting and sewage systems and have increased the size of the marshalling area. Despite technical challenges and severe weather conditions project team members including McLaughlin & Harvey and Halcrow Group have done a great job of reconstructing Port Ellen pier. We’re delighted to have it back open and our official opening was all about thanking the community for their patience and understanding. 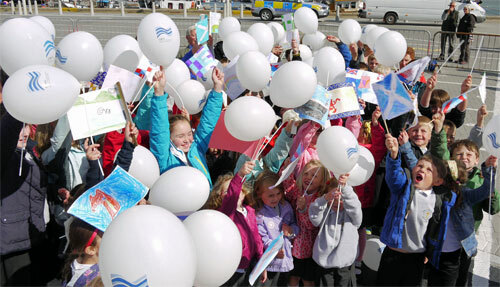 It was a great day with beautiful weather and we were lucky enough to have Port Ellen Primary School children singing at the event. I want to thank everyone who came along to celebrate. 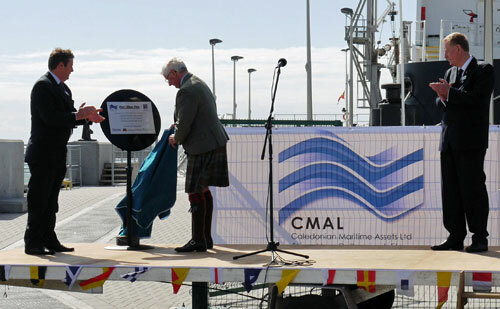 For some further impressions of the new pier look at Port Ellen Pier Reconstruction complete on the CMAL news page.